Spring Lake is open seven days a week during regular business hours (see website for seasonal hours). You may visit at any time. If you would like to schedule a free private venue tour to discuss the details of your event please contact the Special Event Coordinator via email at SpringLakeEvents@txstate.edu or call 512.245.7557. 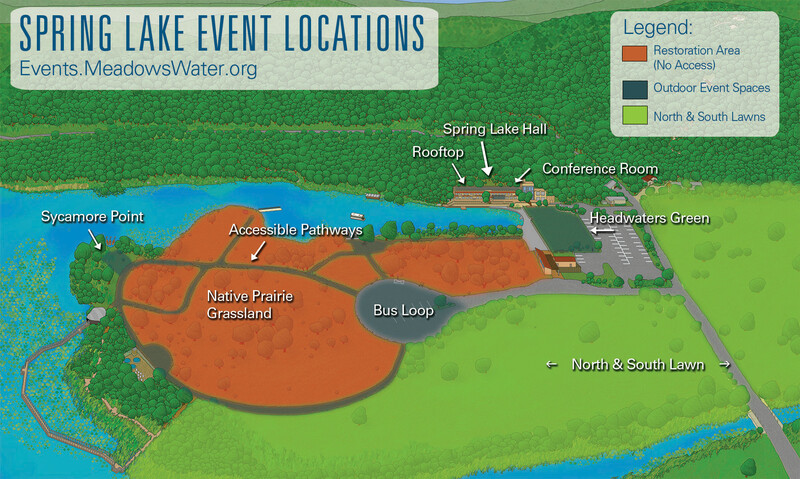 Please fill out the following form when requesting to hold All Park Festivals or events that include access to Spring Lake, which must be approved by the Spring Lake Environmental Review Board. Please read the Outdoor Reservations and Policies below. If you wish to make a reservation request, complete the Reservation Request Form and send to Spring Lake Reservations. If you plan to have food served at your event, you must use a Texas State approved caterer or sign a Food waiver. All alcohol must be served by a TABC server and security provided by Texas State UPD is required at the reserving parties expense. Forms can be picked up at Texas State UPD office on campus. For live music, please read the Texas State UPPS. Questions can be sent to Spring Lake Reservations. A reservation fee will be assessed according to area and user priority status (see below). Please note that the park will remain open to visitors during posted business hours. Rentals are for four-hours with one-hour set-up, and one-hour break-down. Overtime charges of $10/hour will be assessed for each hour over the allotted time. Evening events must end at 11 p.m. The Roof Top at Spring Lake Hall provides a bird’s eye view of the springs and park below. It can accommodate up to 200 people for your gathering depending on the furniture you decide to rent. Celebrate in style surrounded by interactive exhibits and aquariums. This space is perfect for small cocktail parties and may be rented alone or in conjunction with other areas of the park. This area is limited to use after business hours. Overlooking Spring Lake and the restored meadow across the water, this paved area is the right size for small dinners or cocktail parties. Rent the adjoining Conference Room for the perfect buffet serving area. This area is limited to use after business hours. This area is a large open lawn overlooking Spring Lake, the Headwaters of the San Marcos River. It is capable of accommodating a very large number of people depending on the amount of furniture you rent. A view of Texas State’s Old Main building is a prominent feature. A new addition to our Special Event space, this is our largest space for events, at 40,000 sqft. It is located on the old golf course and looks out towards Sink Creek. It is highly recommended for events that are expected to have a large number of people attending. With the Balcones Escarpment and Spring Lake as a lush backdrop, this area is the perfect spot for a small ceremony right by the water. This area also features a great view of Old Main. This is part of our blacktop parking lot and provides a large stable space for gatherings. Parties using this area will need to figure out another place to park their guests during the event. This area is most often used for large festivals. Organizations can make use of the full park grounds for large festivals and events. Past events like the Powwow, have included craft and food vendors, public speakers, dances, ceremonies, and more. Add a special touch to your events by reserving a glass bottom boat for you and your guests. 20 people will fit on one boat. The conference room is great for meetings or presentations. Organizations and parties interested in renting the conference room space should click here for more information. Required if alcohol is served or for events over 100 people. All events are subject to a Cleaning Fee of $50 plus $25/hour staff time if areas are not left as they were found. A credit card will need to be on file before the event takes place. Reserved area(s) must be left in clean condition with all trash bagged and removed from the property. Failure of a group to exercise proper care of facilities will result in the loss of future reservation privileges. Spring Lake Staff rate is $25 per hour. Staff may be used to help with setup, clean up, parking, and more. The Event Coordinator will determine the number of staff needed for the event. An Overtime Fee of $10 per hour will be assessed for the use of the facilities beyond or prior to posted park hours. Events serving alcohol are required to hire UPD Officers to provide security. Any event not serving alcohol but over 100 people attending will be required to have a UPD officer on site for security. UPD officer rate is $40 per hour per 100 guests. There is a minimum of 4 hours per officer. The ability to serve alcohol will be at the discretion of The Meadows Center and the University Police Department. Cancellation Policy: All events are subject to a $50.00 non-refundable deposit. This deposit will be applied to the final invoice. Functions scheduled from Monday 8:00 a.m. through Friday 5:00 p.m. require a seven (7) working day cancellation notice. Failure to cancel a scheduled event will result in a $25.00 cancellation/no show fee to the reserving party. Functions scheduled from Friday at 5:00 p.m. through Sunday night require a 30 day cancellation notice. If a cancellation notice is received less than 30 days prior to the function, a $150 cancellation fee will be charged to the reserving party. Event Coordination: Our Special Events Coordinator can help you organize your event with everything from tent rentals, DJs & vendor selection to cake & caterer selection and can even help you pick out decorations. *Rates vary depending on level of service required. Tables and Chairs: The Meadows Center does not guarantee availability. However you may request to reserve up to 50 blue folding chairs and 15 8’ folding tables for your event at no charge. All tables and chairs must be set-up by the party renting the facility, unless set-up is arranged with the facility coordinator and a fee is applied.